StageBuzz.com: FRIGID New York Interview - Sergio Solorzano of "The Mysterious Mystery of Mystery Street"
FRIGID New York Interview - Sergio Solorzano of "The Mysterious Mystery of Mystery Street"
watched a lot of TV and read comic books as a kid, and I always wanted to be a part of the stories. I also wrote my own comics, which were always crappily drawn, and found that I loved writing. In high school, however, I was solely involved as an actor. It wasn't until college that I decided to put the two together and began spearheading my own projects. My biggest influence is Neil Simon. I've always been a fan of witty dialogue, and this is what drew me to his plays. After reading more of his work, I also found his characters to be very relatable, probably due largely to the fact that they're based off of himself and people he knew. I always try to achieve that level of characterization when I write, and I also make it a point to pay special attention to my dialogue. 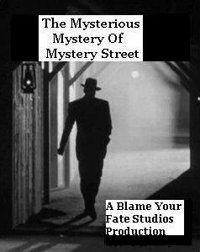 The Mysterious Mystery of Mystery Street starts off like your everyday Film Noir. There's a beautiful lady, a mystery, and two private eyes to solve it. But pretty soon you'll see that this is a parody, and as such things get real silly real fast. We have an ecletic group of characters all played by an equally eclectic group of actors. What this means, and this is the number one thing about this show, is that you never know what's going to come next. My inspiration for writing the show is a video game called Heavy Rain. The game puts you in the middle of a mystery and uses elements of Film Noir to tell the story. The story was so well told and drew me in so much that I knew I had to write my own Noir mystery. The comedic aspect came from creatve partner and actor in the show Adam Brome, who has a gift for putting an unexpected twist on things. As I mentioned, Adam played a big part in the creation of this project. When you see the show you'll see his knack for creative and unexpected choices. Another big player is Ray Fisher, my Co-Director. In particular, he's been instrumental in bringing a lot of the physical comedy into the show. I've known Ray and Adam since college. Another person of note is Maggie McGuire, our female lead who besides being very talented has been marketing the heck out of the show. After FRIGID, I have several plays lined up. What comes next will depend a lot on the reaction to Mysterious Mystery. It will be a choice between a comedy about actors, a sketch show, and a political piece. Also, I'm currently working on a new musical with a very unique concept. I have a very simple message: Come see The Mysterious Mystery of Mystery Street, and you will laugh. Film Buff or not there are at least three jokes for you, you will laugh, and you will be happy you came.